The proliferation of published standards that are relevant to BIM projects could have the effect of causing confusion if not clearly clarified within the Employer’s Information Requirement. Many of the standards cover items that are included within other standards and guidance. For example guidance of file naming is provided in many documents including PAS 1192-2:2013 and BS1192:2007+A1:2015. 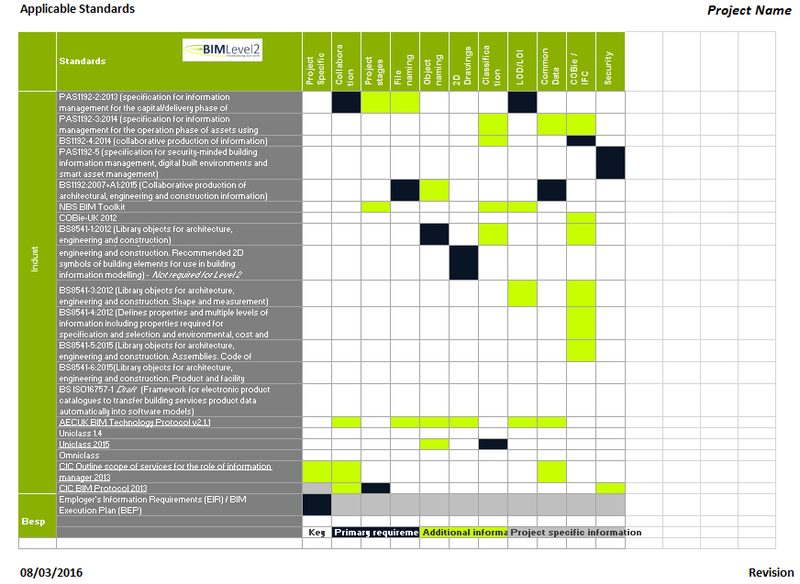 However, any confusion can be avoided by ensuring that it is made clear what standard or guidance takes precedence for each of the main BIM deliverable headings. The document or standard that takes precedence for a particular project will vary from project to project. A standard template for applicable standards can be downloaded below. However, this should be reviewed for you particular project requirements. For example if your project uses the NBS Toolkit then this could be the primary reference for LOD/LOI, classification and project stages. When producing an applicable standards table for inclusion within an Employer’s Information Requirement care should be taken to ensure that only one document is referenced as the primary standard. With all other applicable standards identified as supporting.